"People are who are 'different' are usually the ones that end up making a difference in the world." 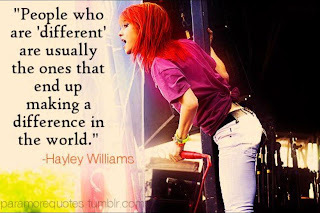 - Hayley Williams. If you don't know how Hayley Williams is, don't worry - I didn't know who she was for a long time either. She is from a band called Paramore, which I have never listened to. But either way, I was scrolling through Facebook and I saw this picture on my feed, that my friend had posted. 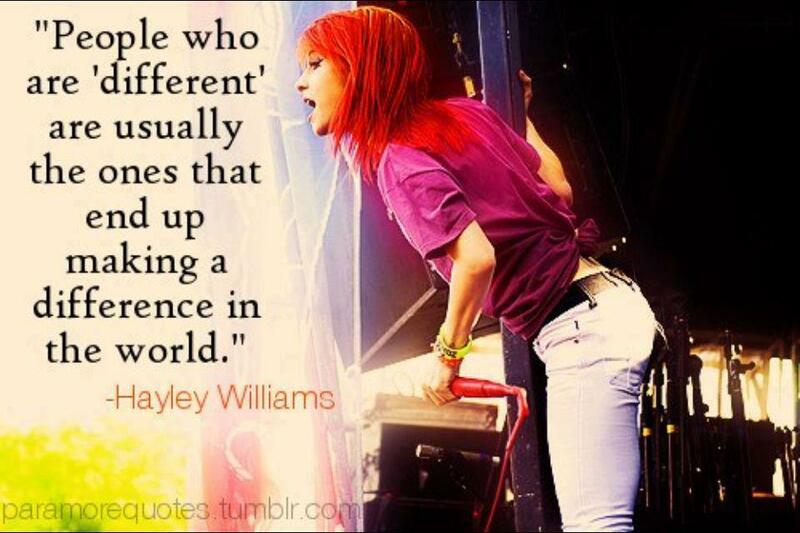 Hayley Williams got it exactly right in my opinion and this quote to me is truly inspiring. Sure people might say you're different, but I encourage you not to view that as bad or to get discouraged. Lets for a moment think about all those people in history who were probably called 'different', 'weird' or 'odd' that ended up making a wonderful impact in this world. Martin Luther King Jr., Albert Einstein, Rosa Parks, Gandhi and Abraham Lincoln (I bet he was teased as a child about his height!). What makes you different, can be your biggest strength. What makes you different doesn't have to be a negative trait nor should it be viewed as one. People who are different can and do make a wonderful change in this world. So embrace the fact that you are different and make a change in this world.